He was pulled out of the swamp by Hoover who then has to convince the Saint to stay on side. This involves lots of patience while the Saint tries to beat his way out of a metal van with his bare fists. It doesn’t go well and he eventually capitulates. Cass (wow… he looks… different somehow) and Tulip are both all torn and (we also have dennis trying to eat his dog and Cass clearly having issues) upset over Jesse in between their banter. This season has lacked banter. Everyone has been so grumpy and mopey there hasn’t been enough banter. Featherstone does not appreciate good banter, still watching on the spycam. Jesse joins them and it’s still kind of tense and awkward. Which is when the Saint returns - without weapons. He fights Tulip, Cass and Jesse - whose voice is on the fritz again. Without supernatural powers, the Saint being super strong and pretty much invulnerable guarantees he knocks Tulip and Cass out out of action - and then captures and ties up Jesse. There follows more bleak and ominous speeches from the Saint which, again, feels far too serious for this very very silly show. He and Jesse have a brief conversation about redemption - Jesse holding it’s possible while Saint convinced he tried it once. And failed. He also pokes at Jesse’s petty attempts to claim he was merciful - Jesse was scared of his own shard of soul being lost to hell. Jesse is saved… but the Hell lady. No, really, the woman who rules hell. She arrives to demand the Saint return on pain of having his place taken by his wife. Against the rules, maybe, but with god gone, who cares? And why would she save Jesse? The Grail. Yes Herr Starr seems to be every bit as powerful as thinks he is. When they’re reunited, Jesse sees the Pope on television telling crowds that god is gone - and that’s pretty bad but hey Jesus is coming back. Um. Sort of. Except Jesse still thinks he is chosen by god for his powers… and he thinks he’s a better choice than the disabled Jesus heir. (I hope that there’s also some consideration that the agents of hell are apparently able to work unhindered). Jesse returns to Herr Starr… who kneels before him. Shooting a child molesting sports mascot. 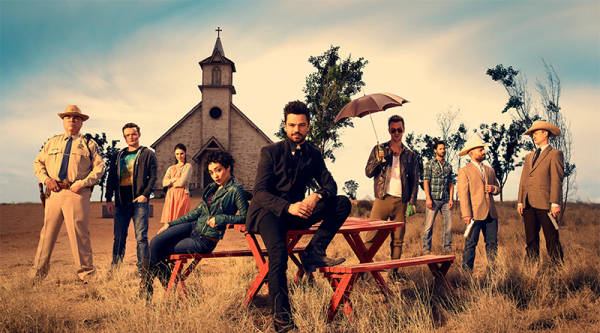 Because… Preacher. Of course.